It was originally written by Carlos Acosta, and published on his website, to manage VirtualBox virtual machines without using the graphical interface. It is written in bash script and uses VBoxManage intensively. 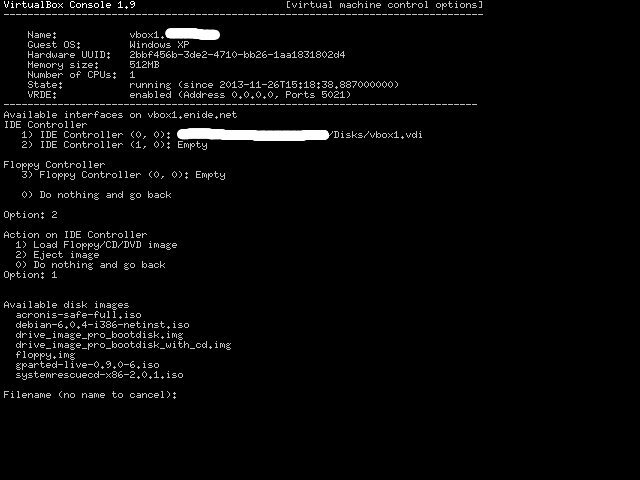 It handles basic start/stop/pause/resume functions, load/unload of removable media and configuration of the remote console port to access the virtual machine's console via vrdp protocol (Oracle VirtualBox extensions must be installed). The original script works as intended and it manages virtual machines but I felt it lacked visual impact. There were some minor inconsistencies between menus and lack of color. There was also a problem with machines containing white spaces in their names that were simply not detected correctly. To make the script operational it's necessary to set its executable bits, at least once after you download it, with chmod. Note: although under Linux it's also possible to run this script with /bin/sh, in MacOS X it isn't, so don't run it with the default /bin/sh (Thanks Lance).